I get what OBLIVION is trying to do. Or at least I think I get what it’s trying to do. Watching OBLIVION I felt myself squinting like Fry from “Futurama” in one of those “Not Sure If…” memes. 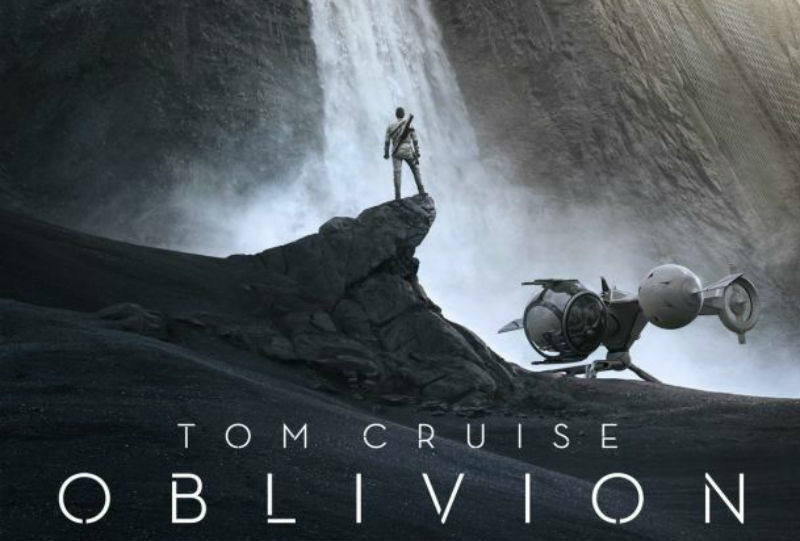 OBLIVION makes a noble try at being a Science Fiction movie with some action in it rather than an Action Movie with some science fiction. If that makes any sense to you. It started out to make sense to me but the longer the movie went on, the more I squinted. The movie’s leisurely pace gave me time to think about what was going on and yep, start doing the “Not Sure If…” thing. After a devastating war with a race of aliens known as Scavengers, The Moon is destroyed and humanity’s Hail Mary use of nuclear weapons has all but destroyed the Earth’s ability to continue supporting life. 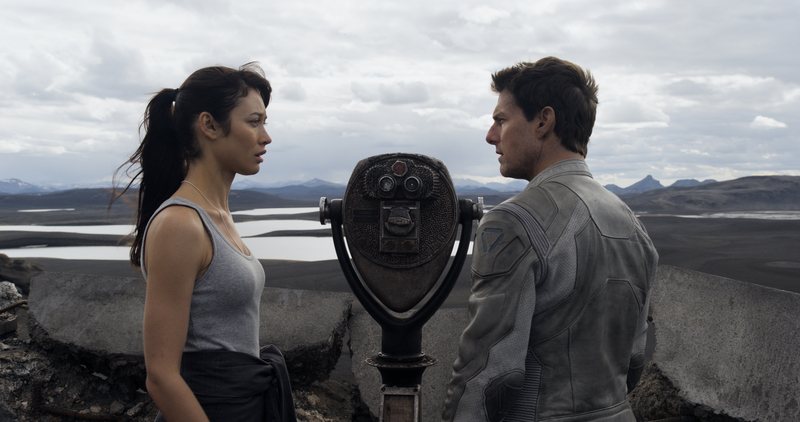 Technician Jack Harper (Tom Cruise) and his communications officer/partner/lover Victoria (Andrea Riseborough) are part of a massive operation to extract water from Earth to use on Titan where the human race has relocated. Jack and Victoria get their orders from their commander, Sally (Melissa Leo) who communicates with them from The Tet, a gigantic space station that resembles an upside down pyramid. Now all of this information is conveyed to the audience in a voice over by Jack in the first ten minutes of the movie. I kid you not. I gave you the short version but just about everything you read in the paragraph above this one is relayed in a voice over, along with the information that Jack and Victoria had their memories wiped five years ago as a security measure in case they’re captured by Scavengers. Do I really have to tell you that any character in any science fiction movie who’s had their memory wiped is not to be trusted? Or that at some point in the movie, everything the characters in the movie have been experiencing will turn out to not be real? Didn’t think so. Jack’s job is pretty much being a glorified maintenance man as he keeps the weapon-laden drones running. They protect the ginormous water extraction machines from those Scavengers that still remain on Earth. But Jack is conflicted in his job. Unlike Victoria who has no desire at all to go down to the surface, Jack feels more at home there than in the mile high tower complex they live in that looks as if it were designed by the same architect who designed the spire where The Jetsons live. He has reoccurring dreams about being on Earth before the war. He’s on the 86th floor observation deck of the Empire State Building with a woman he knows he has deep feelings for but cannot remember her name or why he has these dreams. The answer comes one day during his routine patrol when a sixty year old spaceship, The Odyssey, crash lands near the ruins of the Empire State Building. The ship contains a number of hibernation capsules carrying humans. One of them is Julia (Olga Kurylenko) who is the woman in Jack’s dreams. Defying direct orders from Sally to bring Julia to The Tet, Jack and Julia begin their quest to discover what The Odyssey’s mission was and how it is connected to the war with The Scavengers. OBLIVION has some good things going for it. It’s a gorgeous looking movie with some really cool gadgets and gizmos to ‘ooh’ and ‘ahh’ over. I really dug Jack’s flier which is one of the coolest flying machines I’ve seen in movies recently. The special effects are appropriately amazing but in this day and age of computer wizardry do we ever see a movie with bad special effects anymore? I really wish I could tell you to go for the acting but Tom Cruise doesn’t do anything to stretch his acting muscles in this one. And Tom Cruise can act when he wants to. I point at “Tropic Thunder” “Magnolia” “Collateral” and “Valkyrie” as just a few examples of what Cruise can do when he takes himself off autopilot. I’ve seen Olga Kurylenko in three movies now and the more movies I see her in, the less I want to see of her. Didn’t like her in “Hitman” and actively disliked her in “Quantum of Solace.” She’s not much better here. And Andrea Riseborough is just plain dull. And despite what you see in trailers, Morgan Freeman isn’t a major character in this movie. His character’s name is Malcolm Beech but it should have been Malcolm Exposition as that’s the main purpose Freeman serves here. 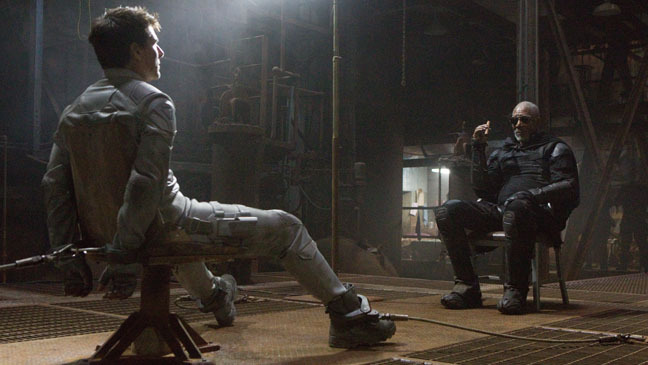 So should you see OBLIVION? Are you a Tom Cruise fan? If so, you’ve probably seen it already or have plans to see it and so nothing I say will change your mind. And that’s okay. Believe me, I understand. Enjoy. The first half of the movie felt like a really good TV pilot to me, but then when all the action started, I got bored really fast. There just wasn’t any surprises for me. Love the look of the film, though. It was directed by the same guy that did TRON: Legacy, which was another good-looking but empty film.